This weekend was really hot. While everyone was complaining about the heat, I was embracing it. It’s already mid-August which means Summer may be over soon (although, I really do hope it will last a tad bit longer). 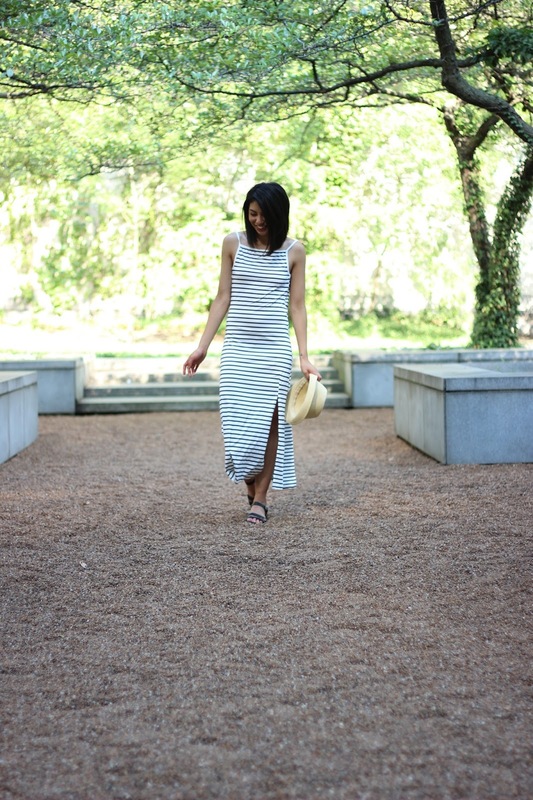 To cool off from the high temps, I decided to wear this striped, backless maxi dress. I think this is one of my favorite dresses of the summer. I love the black and white stripes (such a classic pattern! ), and it is so comfortable! Even though the silhouette is form-fitting, it surprisingly has a flow to it. Not sure if you can tell from the photos, when the wind blows, it flows just like a chiffon dress. I think it has to do with the side slit. The slit is high enough to feel very feminine but still modest. Hope you all have a great Monday! Such a great maxi! Love the back detail. Have a wonderful week Rach! Thanks so much Samantha! Hope you have a great week as well! Love that haircut on you!! Cute dress!! Such a cool maxi! You are rocking the backless trend. This is beautiful! I love the back! Yes very hot! So hot! I think the heat wave will continue for a little bit! You look great!! Keep cool!! This looks like the most comfy maxi ever! And of course I love the stripes! Thanks Audrey! My obsession with stripes is unreal haha! You look very pretty in this maxi dress! The dress is ideal for these very hot summer days! Love the back! Have a great week! Thank you so much! Hope you have a great one too! Rachel, this is so darn cute! 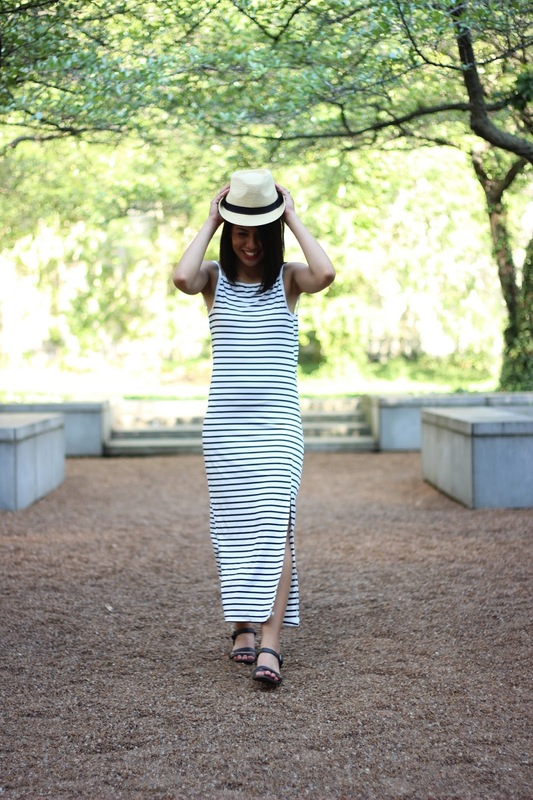 Love the maxi dress and the panama hat! Too cute! Thank you Vanessa! Hope you have a wonderful day! Love that dress, the low back is so dreamy! I love the back! You look stunning! what a fabulous find for $20 dollar. I love the face that it is backless. you look great. Right? The price is too good! You look stunningly chic in this striped maxi dress. I love your style! Really cute maxi. I love the thin whale stripes and the open v-back. As well, the side splits are still on trend. Great casual piece to have. I love backless dresses! So simple and beautiful! Thanks Brooke! 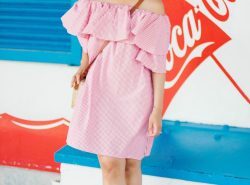 It makes a simple dress more fun! Aw that dress is wonderful! I'm a huge fan of casual maxi dress, i can combine them with everything! Yo uare gorgeous indeed! Thanks so much Eni! Thanks for stopping by! 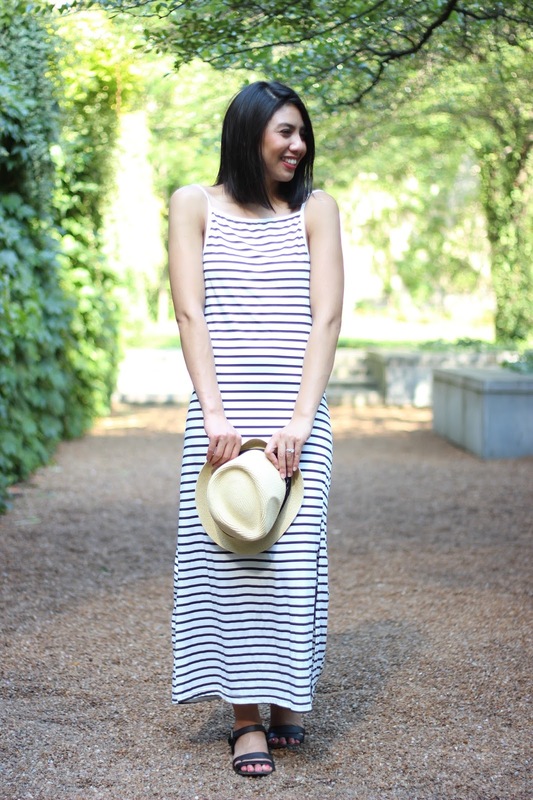 There is nothing like a maxi dress in the summer and this stripe one is so perfect! 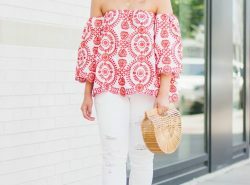 Love it paired with the straw hat, so cute! I try my hardest o never complain about the heat. As much as I love fall and can't wait for booties and scarves, I hate what comes next. All that dreaded snow. Being from Chicago I know you totally understand what it's like to literally have snow up to your knees! I think that's why I'm not excited about Fall. The thought of Winter (besides the holidays) is just brutal! Thanks Kiki! Ahhh, I love this dress so much! The scoop back is gorgeous, and stripes are so classic. You look amazing! Thanks Idalia! Thanks for stopping by! Such a pretty casual dress! So great seeing you last night! Thanks Heidi! So good seeing you too! This striped maxi is perfect…absolutely beautiful look! I love that sweet stripped maxi! You look so darling!